The Children's of Mississippi capital campaign is a third of the way to its $100 million goal. 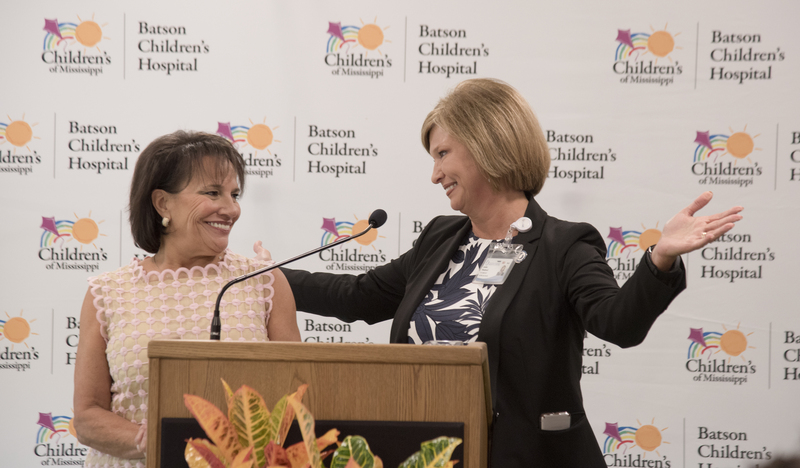 Friends of Children's Hospital, a nonprofit group dedicated to raising funds for Batson Children's Hospital, has committed to raising $20 million over the next 10 years to go toward the fund, which will help the Medical Center expand and update its space dedicated to pediatric care. The campaign, chaired by Joe and Kathy Sanderson, was started in April with a personal $10 million pledge from the Sanderson Farms chairman and CEO and his wife. 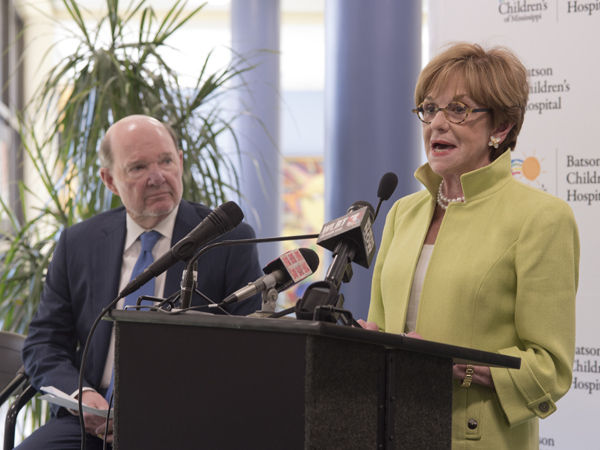 “Friends of Children's Hospital is extremely proud of the $17 million we've raised since 1989 and the impact that it's had on improving health care for Mississippi's children,” said Sara Ray, board chair of the group. “We were among the first on board when the Medical Center needed support to build Batson Children's Hospital in 1997 and have contributed annually ever since to enhance the patient and family experience. Dr. Rick Barr, Suzan B. Thames Professor and chair of pediatrics, pumps his fist after hearing Ray announce the Friends gift. Children's of Mississippi is the umbrella organization that includes Batson Children's Hospital and all UMMC pediatric care, including clinics offering specialty care around the state. Plans for the future include an expanded and renovated neonatal intensive care unit, more rooms for the pediatric intensive care unit, more operating rooms and the creation of an imaging clinic especially for pediatric patients. A new pediatric clinic will make care for outpatients more convenient and comfortable for families. Joe Sanderson watches as Kathy speaks during the April press conference held in the lobby of the Children's Hospital to announce the fund-raising campaign. 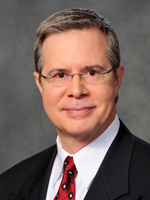 University of Mississippi Chancellor Jeffrey S. Vitter said the commitment to excellence shown by Friends of Children's Hospital volunteers and leaders is a testament to their long-time support of the University of Mississippi Medical Center's pediatric care. The first $3,000 in the building fund of what would become Batson Children's Hospital came from Friends of Children's Hospital. By 1994, when plans for a new children's hospital were drawn, Friends of Children's Hospital pledged $175,000 to make the first five floors a reality. Later, when the sixth and seventh floors were added, Friends of Children's Hospital, which had experienced tremendous growth, pledged $1.7 million to the project. 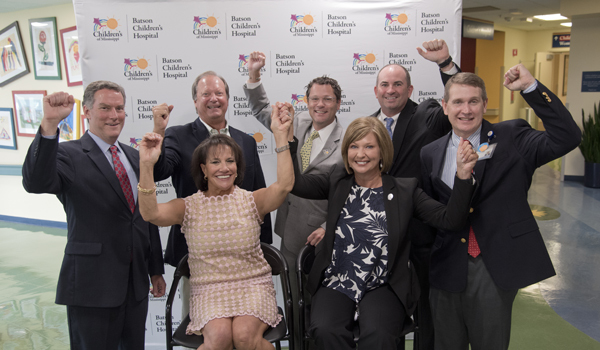 Celebrating the announcement are, seated, Ray and Woodward; and, standing, from left, Barr, board member Sidney Allen, board president Rob Armour, board member Bruce Leach and Children's of Mississippi CEO Guy Giesecke. Later, in 2009, the Eli Manning Children's Clinics at Batson Children's Hospital opened, thanks to a partnership between the nonprofit and Eli Manning, which raised $3 million over five years through an annual gala event, An Evening with the Mannings Presented by BankPlus. 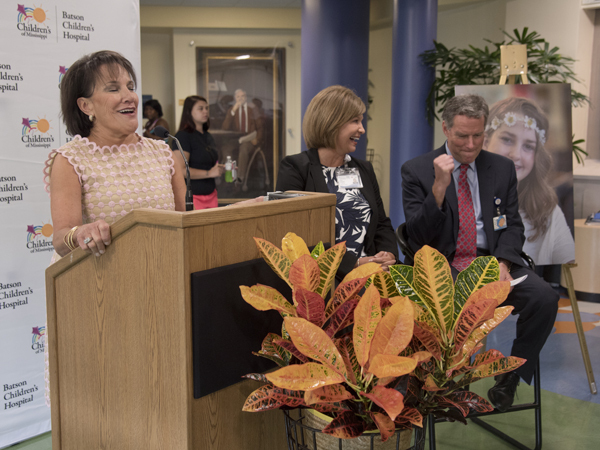 Friends donated another $1.7 million to the expansion and renovation of the children's emergency room.